FIRST AFL GAME PROGRAM TEXANS vs OILERS Dallas Cotton Bowl September 2, 1960. 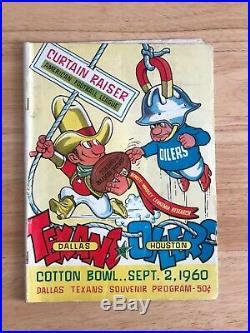 The item "1960 AFL FIRST GAME PROGRAM TEXANS vs OILERS Dallas Cotton Bowl Sep 2, 1960" is in sale since Tuesday, April 9, 2019. This item is in the category "Sports Mem, Cards & Fan Shop\Vintage Sports Memorabilia\Photos". The seller is "danel4734" and is located in Dallas, Texas.